With the first official day of summer just around the corner, I thought it would be fun to put together a list of my warm weather essentials. 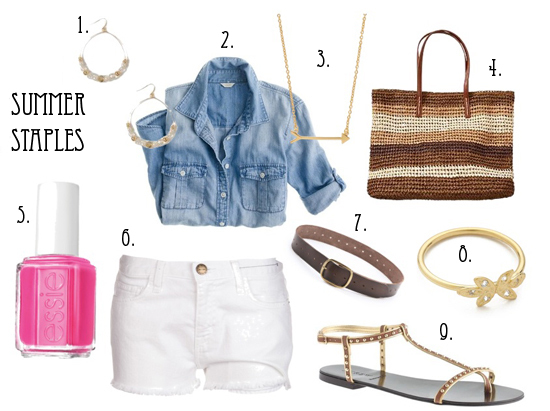 A classic chambray shirt, white cut-offs, bright nails and delicate jewelry is a look I will never get tired of. What are you wanting to wear this summer? 9. J.Crew Studded T-Strap Sandals - have these and LOVE them! chambray + white denim, it doesn't get better! Speaking of, I need to find me a new pair of white denim shorts! I love this look! This is SO my style for spring and summer.